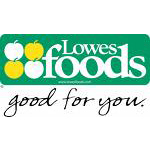 Lowes Food Stores is an American based company that owns and operates grocery stores. Lowes Food Stores operates as a subsidiary of Alex Lee Inc. The company was founded by Jim Lowe in the year 1954 and it started its operations a single store in Wilkesboro, North Carolina. The store was then sold to MDI and both MDI and Lowes went on to become divisions of newly formed company, Alex Lee Inc in 1997. Lowes Food Stores provides the consumers with a variety of products which includes grocery, bakery, deli, meat, produce, seafood, dairy, fuel and flowers.